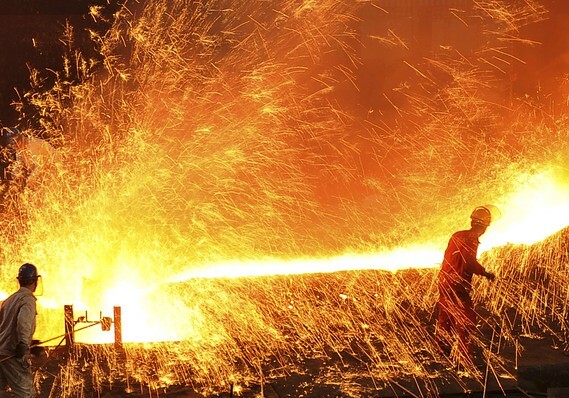 Steel factory in Liaoning, China. WASHINGTON – The European Union will impose import tariff quotas of 25% on a number of steel products Thursday to protect the European market from the effects of the U.S. tariffs on steel and aluminum, the European Commission announced Wednesday. The provisional safeguard measures – imposed against all countries outside the EU – cover 23 steel product categories. For each of the categories, tariffs of 25% will be levied only after imports exceed the average of the last three years. The Commission is resorting to retaliatory tariffs to avoid a sudden increase of imports that would hurt European steelmakers. As a result of the import duties applied in June by the United States under Section 232 of the U.S. Trade Expansion Act – 25% on imported steel and 10% on aluminum – exporting steel to the U.S. has become less attractive, and steel suppliers have diverted some of their exports to Europe. The steel sector represents a vital industry for the European Union’s economy, providing jobs for hundreds of thousands of European citizens. In 2016, the global surplus in steelmaking capacity reached a record 737 million metric tons. This has depressed steel prices, damaging the steel sector and related industries. Under the World Trade Organization’s rules for the application of safeguard measures, provisional measures may be imposed when “there is clear evidence that increased imports have caused or threaten to cause serious injury.” Such measures should be in the form of refundable tariff increases, and may be kept in place for a maximum of 200 days. The measures are part of a three-pronged response against U.S. tariffs. The EU already imposed 10% to 25% duties on $3.2 billion in U.S. imports on June 22, and will be imposing 10% to 50% additional levies on $4.2 billion in U.S. imports in 2021. An email left with the U.S. Trade Representative was not returned, and the public affairs department didn’t answer the phone.